I always like to batch cook soup to have in the freezer ahead of the winter. It makes for a quick, warming meal, of course, but my motivation lies mainly in the desire/ need to have homemade and satisfying soup readily available in case I fall ill. 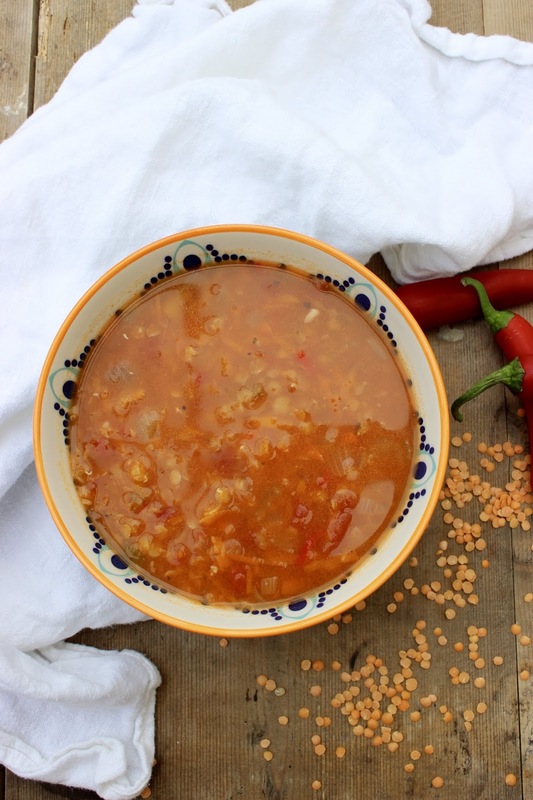 This Spicy Lentil Soup covers both bases. It's satisfying thanks to the earthy lentils and has a kick to it which is something I particularly crave when ill. 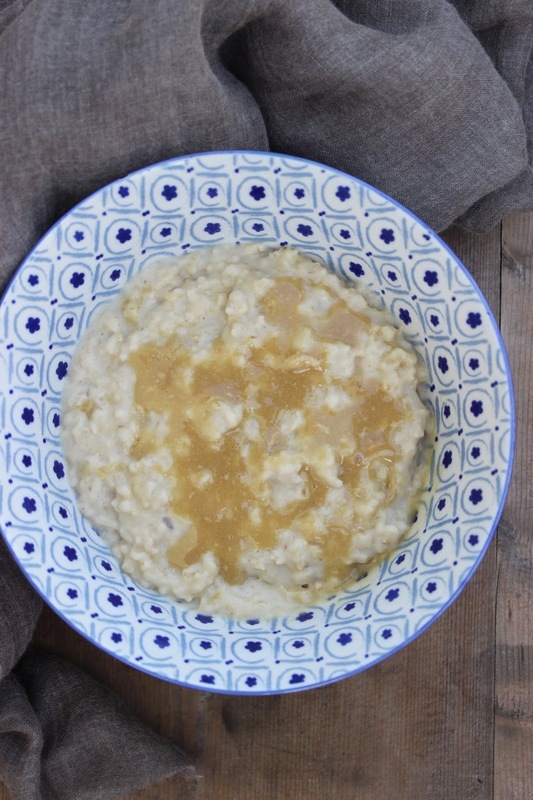 If you're feeling run down or ill, this soup will help you on the road to recovery. That said, there's a slightly superstitious side to me which (sort of) believes that if I'm prepared for any illness that strike, then I inevitably won't get ill- here's hoping! In any case, I hope you'll enjoy this soup- it's one of my boyfriend's favourite recipes from the site. 1) Warm the oil in a large saucepan over a medium low heat on the hob. Add the onion and lightly fry for a couple of minutes until softened. 2) Add the celery, carrot, garlic and chilli and lightly fry for a further minute or so, stirring regularly. 3) Stir in the tomato puree and chopped tomatoes, followed by the lentils and vegetable stock (swish in the empty chopped tomatoes tin to make sure you obtain all of the juice). Season with salt and pepper. 4) Bring to the boil then reduce the heat and simmer for 20 minutes, stirring regularly. I make dips pretty much on a weekly basis. I like to make them at the weekend to serve as an appetiser before our regular family get togethers & I tend to make a lot so that I can enjoy them as an easy snack or addition to nourish bowls, accompaniment to falafel, etc.. during the week. I've mentioned previously that because I make dips so regularly, I like to switch up the flavours to keep things interesting. 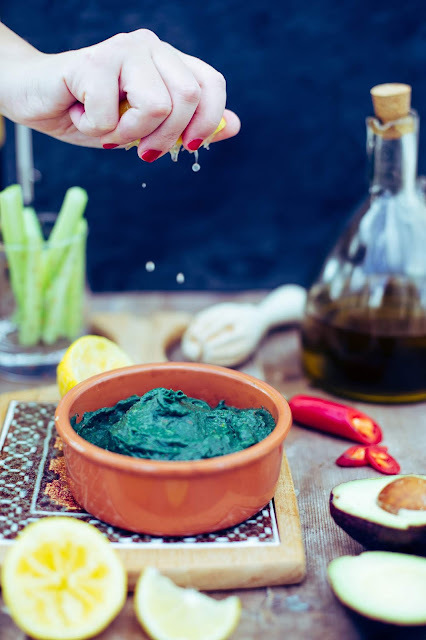 I was inspired to create more recipes using spirulina, a "superfood" algae renowned for its numerous health benefits so decided to incorporate it into a dip- & the resulting vibrant colour was certainly a talking point at the week's family gathering! Personally, I like the taste of seaweed (which spirulina is reminiscent of) but if you're not a fan (or perhaps if you are trying for the first time) and still want to obtain some of the benefits, simply reduce to 1- 1 &1/2 tsp spirulina powder. 1) Place all of the ingredients in a food processor and whizz until combined and creamy. 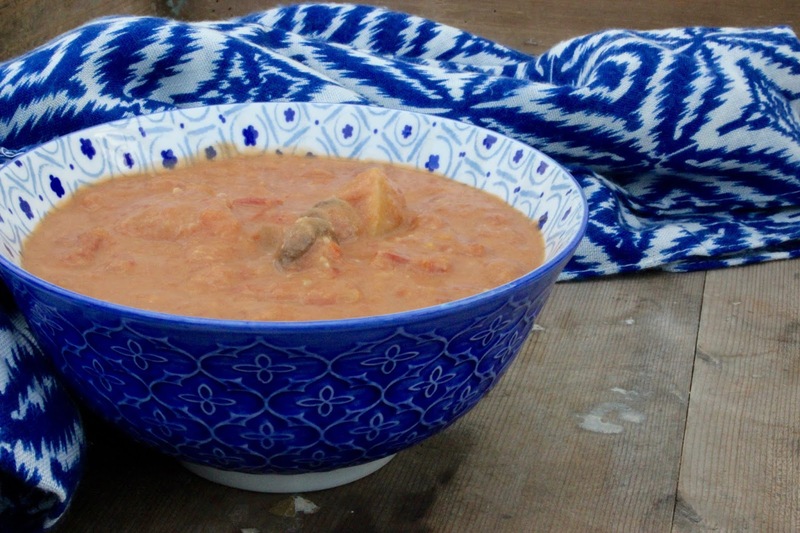 It's National Curry Week this week and although I know that I share a lot of curry recipes, I couldn't resist marking the occasion by sharing another one. 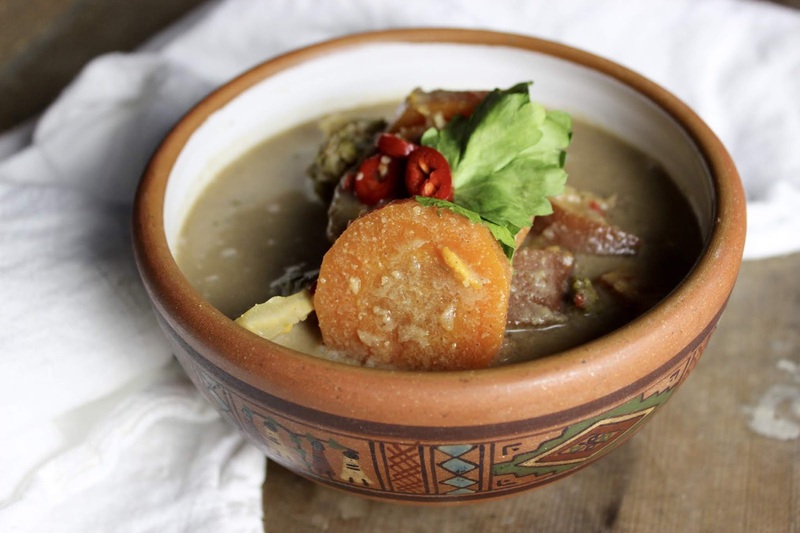 This takes inspiration from the flavourful yet fairly mild Thai massaman curry and whilst the ingredients list may appear quite long, it can be made with any veggies you have which need using up- hence the name! This is a great addition to your repertoire as it's quick & easy to make, is perfectly suited to advance prep & batch cooking and works well with rice and noodles alike (I really like it with brown rice noodles thanks to the fairly liquid sauce). Note that step 1 can be prepared in advance if you're particularly short on time. 1) Start by making your massaman curry paste. Place the onion, garlic, ginger, chilli, lemongrass, maple syrup, lime juice, coriander seeds, cumin seeds, cinnamon, cloves and nutmeg in a food processor and whizz to combine, until a thick paste forms. 2) In a large saucepan, warm the coconut oil over a medium heat on the hob. Add the massaman curry paste and lightly fry, stirring constantly, for a minute. 3) Next, add the vegetables and stir so that the vegetables are coated in the paste. 4) Add the nut butter, tamari, coconut milk, vegetable stock and salt and stir to combine. Simmer for 20 minutes, until the vegetables are cooked through. I know that this may sound like a strange recipe but you're simply going to have to trust me on this one! Brownies always prove popular- not only are they an instant crowd pleaser but the proof in the pudding, if you'll pardon the pun, is that they're amongst the most popular recipes on my website, with the Nutella Brownies and Chocolate Orange Brownies both consistently in my top three most read recipes. Don't be put off by the unusual ingredient in these as I'm sure that once you try them, you'll love them as much as the other brownie recipes I've shared.. the black beans add a wonderfully indulgent fudgy texture & I love them so much that I was tempted to really go overboard on the alliteration and call them "Best Ever Black Bean Brownies"! 1) Start by making the "chia eggs" by combining the chia seeds with 6 tbsp water. Set aside for half an hour, until a gel forms. 3) Place all of the ingredients, including the chia eggs but except for the walnuts, into a food processor and whizz together until smooth. 4) Pour the mixture into the prepared brownie tin and smooth the top to ensure it's an even layer. Sprinkle with the walnuts. 5) Bake for 25 minutes, until firm to the touch. Remove from the oven and allow to cool completely in the tin before cutting into squares. I woke up the other day feeling tired and hungry.. but after pressing the snooze button one too many times, I was also in a hurry. Necessity being the mother of invention, I threw together this smoothie incorporating energy boosting matcha and enjoyed a healthy breakfast on-the-go. It's satisfying and packs in a couple of portions towards your "5 a day", whilst most importantly, being delicious! It certainly helped to perk me up even if I did get out of bed on the wrong side! 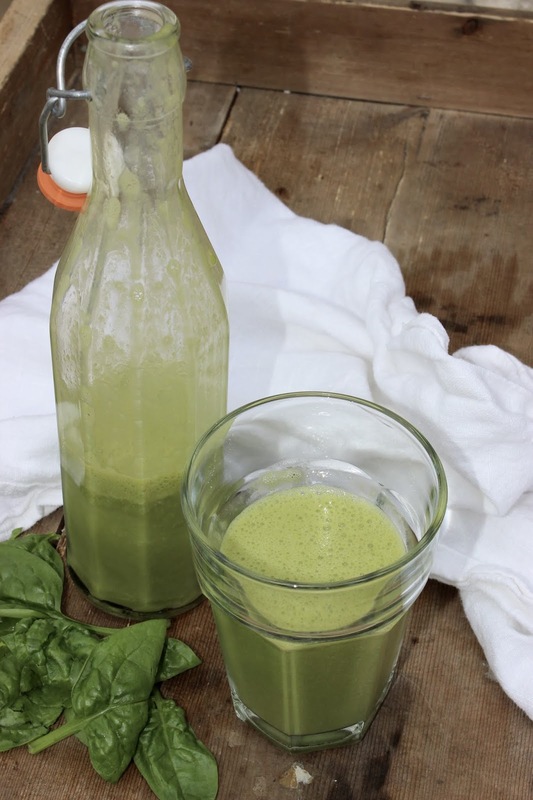 1) Place all of the ingredients in a blender and blend until smooth. Enjoy immediately. I've been wanting to share a recipe for a Beetroot and Cacao Cake for quite some time & was really clear in the design I wanted, etc.. but my delay goes to show just how many recipes I feel inspired to create! It was worth the wait because this turned out perfectly and if I do say so myself, this might just be one of the best recipes I've shared to date! 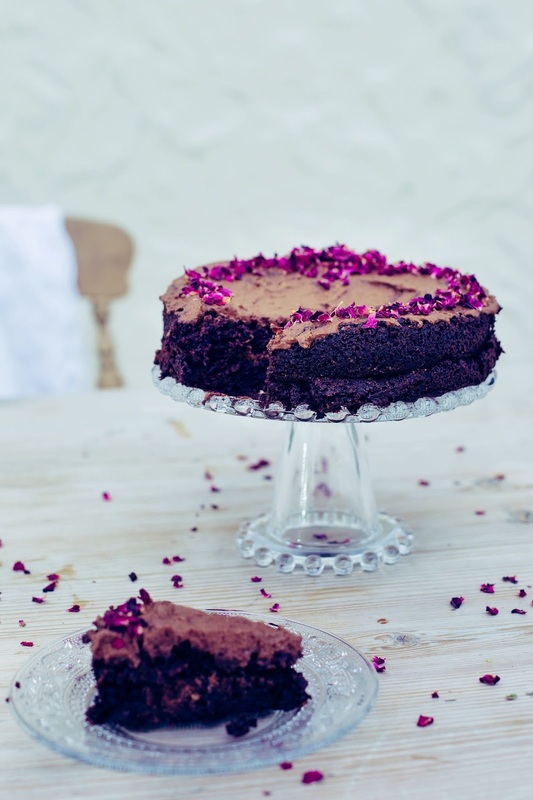 The beetroot adds a subtle earthiness but keeps the cake lovely & moist, whilst the fudgy texture and rich chocolate flavour, complete with indulgent icing make this the ultimate cake! It looks impressive to share and acts as a talking point too. It may sound like an unusual combination (I imagine the first time people heard of using carrots in cake that it sounded strange!) but it does work & I really hope that you'll give this a go! 1) Start by making flax "eggs" by combining the milled flaxseed with 8 tbsp water. Refrigerate for approximately half an hour, until a gel forms. 2) Preheat oven to 180 degrees C. Grease two round 8 inch sandwich cake tins with coconut oil. 3) In a large mixing bowl, combine the flax "eggs" with the coconut sugar, coconut oil, almond milk, maple syrup, apple cider vinegar and vanilla. Stir in the beetroot. 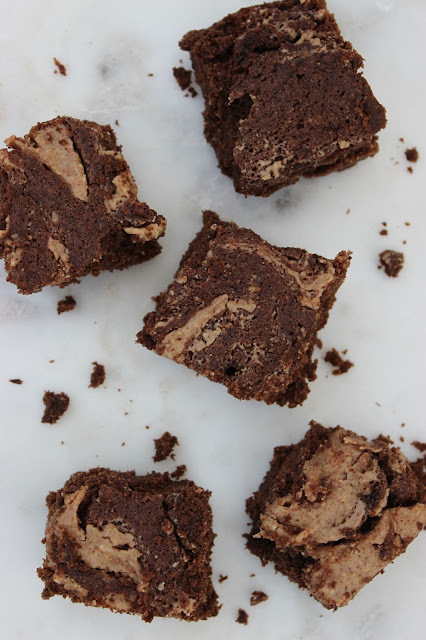 4) In a separate bowl, combine the ground almonds, cacao powder, baking powder, bicarbonate of soda & sea salt. 5) Add the dry ingredients to the beetroot mixture and stir well to thoroughly combine. 6) Divide the mixture evenly between the two cake tins and bake for 35 minutes, until firm to the touch but not over baked. Allow to cool completely in the cake tins before icing. 7) To make the icing, whisk together the coconut yoghurt, maple syrup, coconut oil and cacao powder to thoroughly combine, ensuring that there are no lumps. Use half of the icing to layer the two cakes together and the remaining icing to ice the top of the cake. Decorate with rose petals, if desired. This simple but flavourful curry is perfect for a mid-week meal. As tends to be the case with this type of dish, it tastes even better if made in advance so that the flavours have a chance to infuse. I like to serve this on a bed of brown rice and sprinkled with chopped coriander. 1) Heat the coconut oil in a saucepan over a medium heat on the hob. Add the garlic, chilli and ginger and lightly fry for a minute. 2) Add the butternut squash, followed by the mushrooms and red pepper and stir well. 3) Stir in the chopped tomatoes and coconut milk. Simmer for 10 minutes. 4) Stir in the miso paste and salt and simmer for a further 10-15 minutes, until the squash is cooked through. Lots of you have been asking for autumnal recipes and now that the temperature has started to drop, I've been feeling really inspired! These Pumpkin Spiced Cookies aren't too sweet but contain comforting spices, oh-so-autumnal pumpkin and have a crumbly, cookie-like texture. 1) Preheat the oven to 180 degrees C. Line a baking tray with a silicone sheet or baking paper. 2) In a mixing bowl, combine both types of oats along with the pumpkin seeds, coconut sugar, baking powder, salt and spices (cinnamon, nutmeg, ginger and cloves). 3) In a separate bowl, combine the pumpkin puree, coconut oil and vanilla. 4) Add the pumpkin mixture to the dry ingredients and stir well to combine. 5) Using your hands, take a small portion of the mixture and shape into a ball (approximately the size of an energy ball). Squash the ball so that it forms a flattened cookie shape and place on the prepared baking tray. Repeat until all of the mixture is used up. 6) Bake for 20 minutes, until golden. Carefully remove the cookies from the baking tray and allow to cool on a wire rack. For me, apple and cinnamon is such a classic combination which perfectly captures the flavours of autumn and feels so comforting. 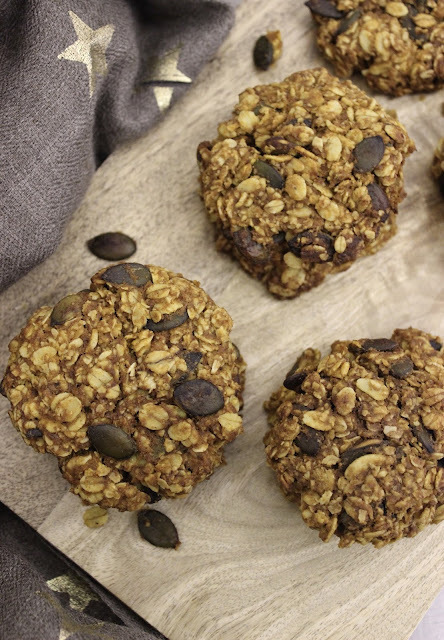 These bars are inspired by the classic combo and are ideal as a snack or even as a handy breakfast on-the-go. What's more, they're nut free so can be included as a school lunchbox treat. I hope you'll give them a try. 1) Place the apples, along with 1/2 cup water, in a medium sized saucepan on the hob over a medium heat. Boil together for approximately 10 minutes until the apple is softened. Mash roughly so that you're left with a chunky apple puree. Note: You can do this step in advance, if desired. 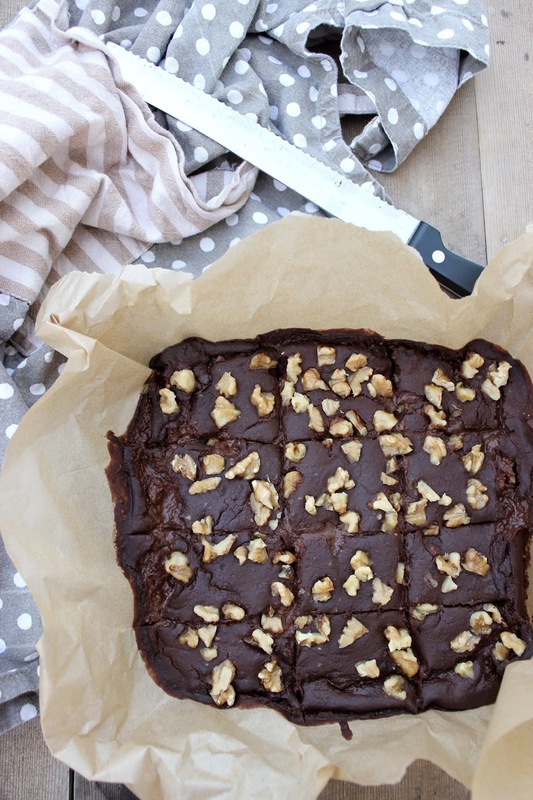 2) Preheat the oven to 180 degrees C. Grease a 10.5 x 8 inch rectangular brownie or cake tin with a little coconut oil. 3) In a mixing bowl, combine both types of oats along with the raisins, cinnamon and salt. 4) Stir the date syrup into the apple, then add the apple mixture to the oat mixture and stir well to thoroughly combine. 5) Press into the prepared cake tin. Bake for 20 minutes, until golden. Allow to cool in the tin then slice. Confession time... I never actually used to like bananas. Now they're my go-to smoothie base as they're an affordable way to instantly add a lovely, creamy texture. That said, through my own personal experience I can appreciate that they're not for everyone so today's smoothie is a banana free option, which still sneaks in a portion of fruit. The combination of pear and vanilla make for an indulgent, sweet smoothie which is wonderfully thick and creamy. 1) Place all of the ingredients in a blender and blend until smooth and creamy.